"This really is a great, and simple recipe. The sauce is pretty rich, so you want something just thick enough to coat the meat, but not so thick that it covers it up. Having said that, if you cook it a little further, until it almost starts to simmer, it will get a bit thicker, if that's your preference. Just don't go too far, or the yolks may start to form curds, and you'll lose the silkiness. Serve over buttered toast or in freshly baked puff pastry shells." Season lobster tails with salt. Heat clarified butter in a large skillet over medium-high heat. Place tails, meat-side down, in hot butter and saute until just cooked through, about 2 minutes per side. Transfer to a plate to cool. Pour sherry into the skillet and bring to a boil while scraping the browned bits of food off of the bottom of the skillet with a wooden spoon. Cook until sherry is reduced by half, about 1 minute. Remove skillet from heat. Pull meat from shells; discard shells and roughly chop lobster meat. Pour any accumulated juices from the plate into sherry mixture in the skillet. Whisk cream, eggs yolks, nutmeg, and cayenne pepper together in a bowl. Whisk cream mixture into sherry mixture, return skillet to medium-low heat, and cook, stirring constantly, until sauce is thick enough to coat the back of a spoon, 3 to 7 minutes. Stir lobster into sauce and cook until heated through. Season with parsley and salt. 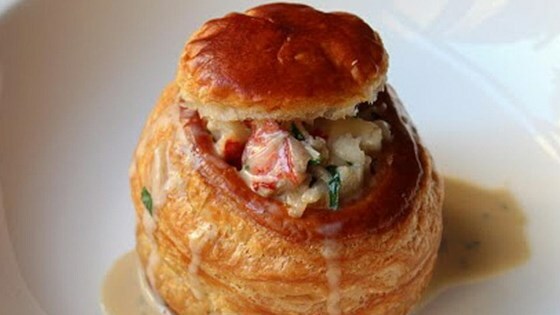 See how to make a shockingly simple, rich lobster dish. You can substitute brandy for sherry, if desired. Get the recipe for Puff Pastry Shells. I was looking for a little more flavor, the Sherry and Nutmeg just did not shine through for me on this one. I made it for a dinner party and it was a big hit. I doubled the recipe for the sauce and added scallops and langastinos to the lobster and called it seafood newberg. I had a little extra lobster so made 1 1/2 x receipe. I did use the pastry shells and it was a huge hit!!! Wonderful. Doubled the sauce and added shallots and fresh mushrooms. Would definitely make again for a special occasion. Delish...with just those few changes that others suggested. (Onion, garlic, mushroom) Very good! Beter to use fresh (live) Maine lobsters. Frozen lobster tails are definitely not my thing.